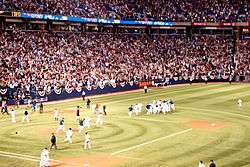 The Chicago White Sox celebrate after defeating the Minnesota Twins 1–0 to win the 2008 American League Central. One notable moment in MLB tie-breaker history came in the final game of the 1951 series. Entering the bottom of the ninth inning the New York Giants were trailing the Dodgers 4–1. Al Dark and Don Mueller each singled to put runners at the corners. Whitey Lockman hit a double, scoring Dark to make the game 4–2. Finally, Bobby Thomson hit a walk-off home run which has come to be known as the "Shot Heard 'Round the World" to give the Giants the 5–4 victory and the National League pennant. ESPN's SportsCentury ranked it as the second greatest game of the 20th century. ↑ "Game of Tuesday, 10/1/1946 – Brooklyn at St. Louis (D)". Retrosheet, Inc. Retrieved May 6, 2010.